When I was a child, we always looked forward to spending the summer in the Ozark Mountains. When we were not working on my grandfather’s hog farm, we were cruising the Eleven Point River on my uncle’s flat bottom boat. It was always fun speeding up and down the river soaking up the sun with the water spraying us in the face. However, my frustration was that I had no experience reading rivers. All of my fishing experience was on ponds and lakes. We could head to a farm pond and catch plenty of fish, but on the river, I was baffled. My uncle would always know the perfect spot to drop his lures or minnows to catch a fish on the first cast. Eventually, I learned to look for the structures and variations in the flow of water that held the most fish. 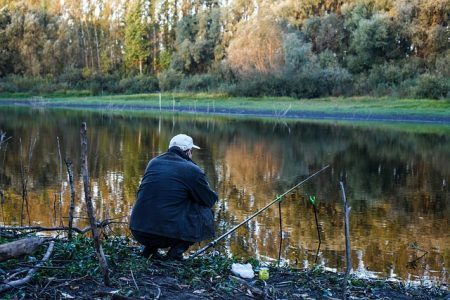 In this article, I am going to cover all the different spots in rivers where you can target fish. I will also cover a brief description of how to fish these spots. 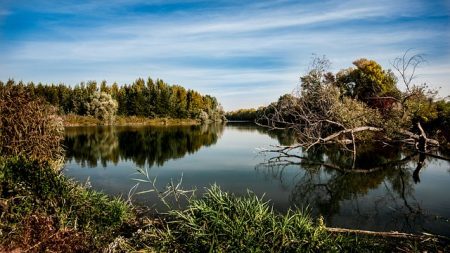 Hopefully, these tips will help you avoid frustration and find hotspots for fish every time out. In rivers, fish can be found in two types of places. You can find fish in cover spots where they are protected from currents and predators. You can also find fish where food sources are most prevalent. Fish will travel back and forth between these protection areas and these food sources several times a day. Either type of spot is a good place to take your rod and cast a line. When swift water flows into an eddy or small inlet, it follows the curve of the bank and creates a small whirlpool. Fish tend to hang out in the slowest moving water in this swirl. This is in the main body of the river where the current kicks the food out into the center channel. Cast your line along here to find fish that are feeding. When you see a steep bend in a river, the fastest water always moves to the outside of the bend. This kicks up food along that outside edge and is also typically where you will find fish. If there is some sort of obstruction like a boulder or tree trunk, this can trap even more food along that edge and give the fish a protected spot to wait. 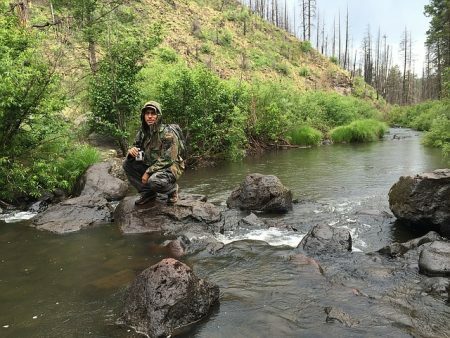 This is the perfect spot to find fish facing upstream for a meal. Any time two moving bodies of water converge, this is an excellent place to find fish. Moving water kicks up the food sources which fish target. It would then make sense that two converging streams would create twice the food at that spot. Also, there is one small spot within the merging currents where the water slows down. Food will hang in this spot, and it is also much easier for fish to sit in this little lull and let food come to them. Fish like to sit in the slow water along the edges of the river, but only if they are protected. Overhanging trees and brush protect the edges from predators and shield the fish from sunlight. Unlike submerged structures, these edges allow large fish to relax but give them an easy escape to deeper water if needed. Any time that water falls straight down, it creates a deep hole below the fall. This whole traps food sources for fish. In addition, at the deepest point of the hole fish are protected from the current. They even get some additional food trapped in the whole trying to swim upstream. These are ideal spots to find fish feeding. 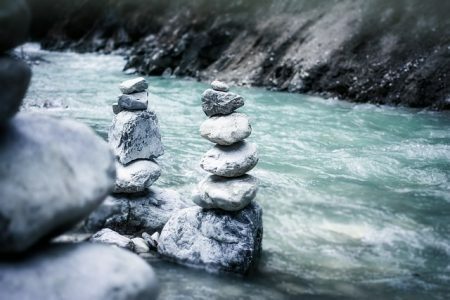 Any time you see waves on a river with white caps that do not dissipate, the water is probably flowing over underwater rocks. The waves will look similar to a rollercoaster as the water flows along the top. Trout, in particular, like to sit in the shallow portions of these waves and collect food, so they are good spots to target. When fast moving water hits a boulder in a river, it is forced to divide and move around the rock. When this happens, it creates a small pocket of still water just behind the boulder. This can be a spot where fish will hide from the current and wait for food. 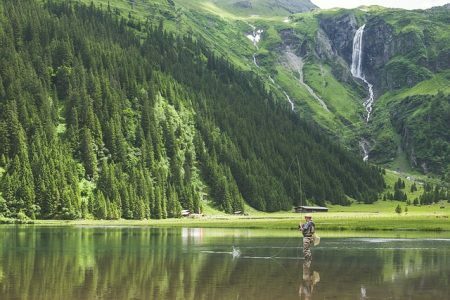 It takes a skillful cast but hitting these spots can land you a nice fish. Any time fast moving water runs alongside slow moving water, you will see consistently small waves along that boundary. These areas are commonly found along bends, bays, or eddies. The change in water speed will catch food and hold it there, so large fish frequent these areas. Any time the river bottom drops off drastically, it is an ideal place to find fish. Not only does the drop off force water downward which slows the flow, but it also pushes food to the bottom of the hole. This gives fish a food supply and protection from the current. These spots are often considered the best place on a river to find large fish. Undercuts are created when the current erodes the steep muddy banks creating a concave, protected hole underneath. If there is a tree above the undercut, that makes for an even better spot. This is where the monsters hide. Trout in particular love the cold water that bubbles up from springs. Not only do they like the cold temperature on hot summer days, but the movement of the water actually makes food sink to the bottom. It is an ideal place for trout to congregate. These are the strips of vegetation where the main channel of a river splits off from shallow protected water. This slower moving water is teeming with critters that make good food for fish, so they are also a great place to target these fish. If you can find a deep pool adjacent to flowing water, it may be an ideal spot. The next time you are on a river, learn to target these spots. Often a slow canoe ride is a good time to identify the different parts of a river. Just remember that protection and food will often equal a good spot to find fish.